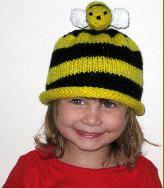 I make all hats with 100% acrylic, non-allergenic, washable yarns in a smoke free environment. For best results, I recommend hand washing in cold water, rolling the hat in a dry towel to remove excess water, and then laying it flat on another towel to dry. While wet, roll the brim as it dries to reform correctly.